I am up with the Lark, delivering milk – in bottles. 1. June 2012 – Germany will win the World Cup. 2. March 2015– A joint Transformers and X-Men movie will be released under the title “Transformen – Robots With Sideburns – Rise of the Pygmies”. The film will be shown in VD. 3. December 25 2014 – A cauliflower will be proclaimed King of England much to the chagrin of Prince Charles. King Cauli will prove to be a wise and benevolent leader. The House of Brassica will rule England for the next 3,000 years. Look in the biscuit tin. Feel your varicose veins for the answer to your conundrum! Right a bit, now left a bit – THERE! Find the man with the name Alfonse on his name tag. Fortune awaits when you do! IF YOU KNOW ANYONE WHO MAY BENEFIT FROM HEARING THESE MESSAGES PLEASE PASS THEM ON…. 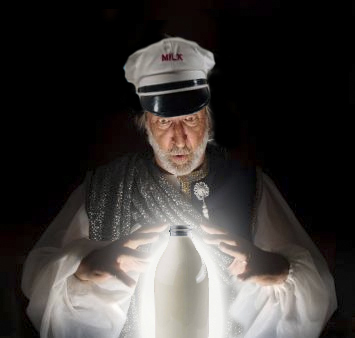 I am now returning the Milk Bottle of Mystery to the Crate of Destiny. 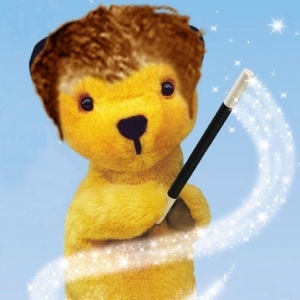 Ginger Sooty filed this from Copacabananananana Beach last night. 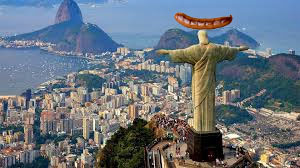 Germany Won The World Cup! Their win had much to do with the inventive attacking play of midfield dynamos Glock and Spiel and the extremely strong ankles of Bastein Shcweinsteiger who took a pasteing from the leery Latin layabouts of Argentina (who should have won). The Germans wonderfully coiffed Coach, Joachim “Me Dye My Hair? – Never!” Louw can now relax and work out the final piece of his masterplan for footballing dominance – the reintroduction of the mullets. 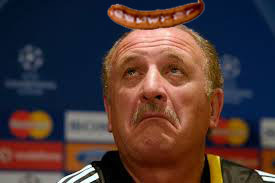 Holland beat Brazil 3-0 in the 3rd place play off game and this probably means curtains for Brazil coach “Big” Phil and his team of wailing God botherers. 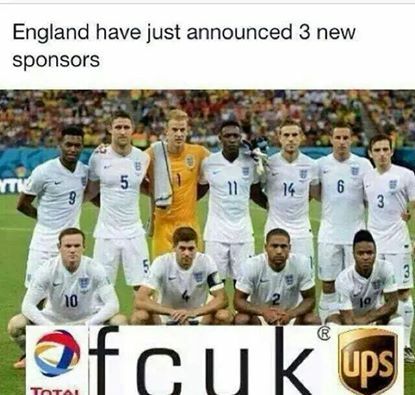 So well done to Germany. 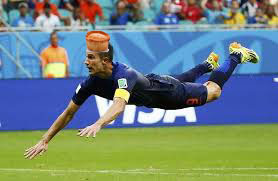 My highlights revolve around two moments involving the Dutch team. 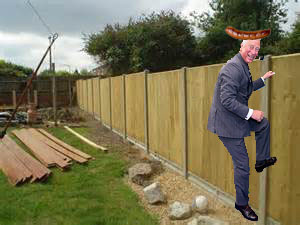 Firstly there was Arjen Robben’sh,”I tripped ova der Mexican’sh shaushage to earn der penlti,” incident. And then Robin Van Persie’s dive-volley header against Spain which marked the beginning of the end of a wonderful Spanish team. This is even more extraordinary when you consider RVP had a meat pie on his head at the time. 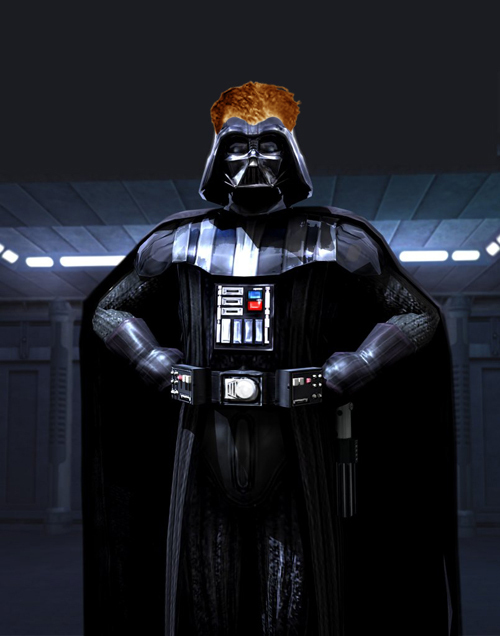 Darth Vader has mad himself available for selection for Germany. Sadly, Buddha has announced his retirement from international football. To celebrate the forthcoming World Cup final between Germany and Argentina – here is an old old story about the relevance of sport in our lives – Glory and a willingness to Cheat to achieve Glory. The following quote is a transcript from on aged acetate recording recently found in the National Archives of the Island of Jersey (War Years – Sporting Activity File 45/7689/QGT/*). He is an old man now. Worn with age and withered by arthritis. But mention of that game, of that moment in that game and a light kindles in Derek Pasty’s rheumy eyes. 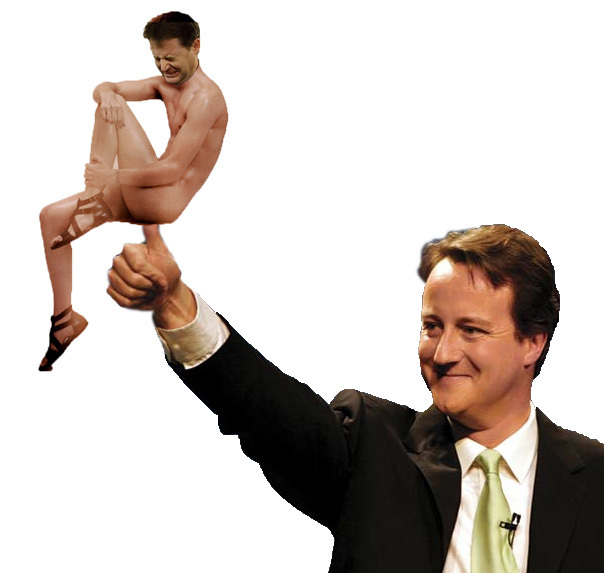 Once more he is the heavy limbed twenty-two year old man of his youth. Derek is recounting a long forgotten chapter in the Beautiful Game’s history and the attempts by the Government of Jersey to place a shroud over it. It is about a football team who took on the might of the evil Nazi war machine and won. Won for themselves, for Jersey and their corrupt trainer. They were the Jersey Gingers. Derek finished his egg and wiped his chin. From a dusty sideboard he retrieved a small battered cardboard box. Alongside the forgotten detritus of everyday life including fingers, pens, a glass case with no glasses and ageing Christmas cards, lay a Match Day programme dated June 6th 1943. A game played between his beloved Jersey Gingers and the crack Hungarian outfit Lepidan FCSS at the famous Stades de Colombes in Paris. It was the final of the Sportsmanship and Athleticism Amongst Aryan Occupied Nations Cup. Perhaps the most notorious football match in history. As he flicked through the browned pages, muttering to himself of memories lost, I could sense he was once again running out at the Stadium in front of nearly thirty thousand French spectators. In June 1940 the Channel Islands were occupied by the evil Nazi empire. Life on the Islands, soon became a harsh regime of spiteful labour and daily hunger as the Islanders came to terms with evil Nazism. Food was in such short supply that some Islanders forgot how to chew. The Gingers were the leading football team on the Channel Islands. 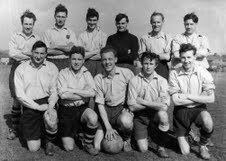 In the pre-war years, now seen as a golden period in Island football, they had edged out their fiercest rivals The Jersey Royals in league and challenge cup competitions. This should come as no great surprise as the Royals were a team made up exclusively of potatoes and a knob or two of butter. Lovely in a salad. The Gingers had turned their ground in Holter Street, Saint Peter, known lovingly as The Plague Pit on account of an earlier use, into what we call today a Fortress. Such was their dominance that there was talk of the Gingers joining the French League, “French fancy dans we called ‘em, all flicks and shrugs and improvised modern dance when a goal was scored. Not our sort at all. 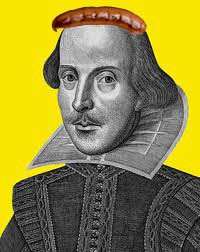 Proper la-di-da.” commented Pasty tartly. The dominance of the Gingers owed much to the quality of their players but also for the tactics they adopted. Known as “Boot and Chop” the Ginger’s game plan was simple. The most successful league campaign by any team on the British Isles ever. Such success inevitably drew the notice of other, darker forces. The Sportsmanship and Athleticism Amongst Aryan Occupied Nations Cup has a dark history. Borne out the evil mind of evil Doctor Goebbels assistant Herman Beckanbauer as a means of displaying unity amongst the Greater Reich, the cup gained traction amongst the upper echelons of Nazi High Command. Teams were selected from each of the occupied lands and a simple knock out cup plan was determined on the strict proviso the Lepidan FCSS won. Pocket – Hero or Villain? The entry of the Gingers was first mooted by Major Fritz Dumpkoff, Camp commandant of one of Jersey’s Stalags, stamp collector and inspiration for haughty German officers in war films. Dumpkoff, in his time a tricky left winger (a term banned in the Third Reich to be replaced with the word Aussenaussenderscneiderbooter – which translates as “wide player not on the right but on the opposite side of the pitch”) took to watching the Gingers home matches and became a firm supporter. He even penned a club song. It was Dumpkoff who approached Gingers coach, Stan Pocket, an avuncular abattoir owner, after the perennial mauling of Sark Casuals 7 – 0 in November 1942. It was only at Pocket’s trial at Weymouth Assizes in 1947 that the full extent of the plan they hatched was revealed. 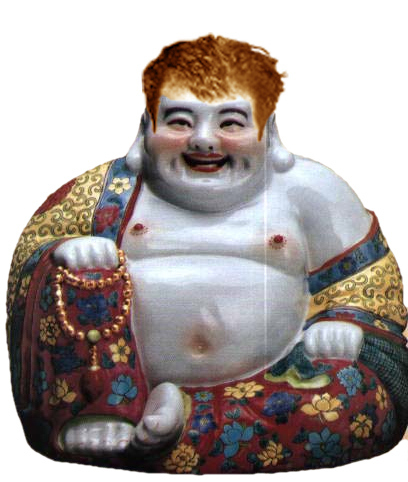 In return for entering the Gingers in the Cup, Pocket would be allowed to smuggle as much contraband as he could find on his travels with Dumpkoff receiving a cut. During the cup run, an amazing treasure trove was smuggled by Pocket and his cronies into the Island. Meat, vegetables, bread, milk, nail clippers, jumpers, cod, clogs, tortoises and thousands of mirrors all sold on the island’s thriving black economy to desperate people starved of essential foodstuffs and a touch of vanity. “We never knew about this plan,” argues Pasty, “All we wanted to do was represent the Island and show that we could play football with the best.” He refused to answer questions about the thirty or so mirrors that adorned his hallway. Older islanders remain tight lipped about this time and it does appear that much of Pocket’s smuggling was aimed at placating opposition to his team’s forays into occupied Europe. “It is amazing what people will do for a piece of liver,” said Pasty. The Ginger’s campaign began with a 2-0 victory (goals from Tongue and Dribble) over Eindhoven Quisling at the Plague Pit one bitter January afternoon. This was followed by a hard fought away victory at Oslo 5th Column Wednesday by a single goal (scored by the prolific Tongue) in icy conditions. That winter saw the people of Jersey dressed in the finest woollen jumpers and also gorging themselves on salted cod from Norway’s verdant fishing grounds. Although those that had forgotten how to chew gleaned less satisfaction from the cod. It was now March, daffodils spawned a shimmering golden carpet throughout the Island. The island folk awoke to the possibility of sporting glory visiting them. The 3rd round beckoned and the draw pitted the Gingers against the reigning cup holders Brussels Blue Shirts, the legendary Flying Flem. The Flem were arguably the greatest pre-war team in Europe and boasted a full array of internationals in their team. They were bankrolled by the Belgian Government’s ill gotten gains from the Congo and could count on Belgian Royalty amongst their legion of fans. Nobody gave the Gingers much hope, after all the Flem boasted a front line of Maginot, Verdun and they quicksilver winger Franco (a naturalised Belgian of Spanish descent.) whose dancing feet earned him the nickname of The Cantilevered Catalan. Tongue again scored, rifling home Parsley’s through pass in the 41st minute and then a fearless rear guard action led by Tree and Fennel limited the opportunities for the crafty Belgians. Then at Pocket’s signal, the team completely switched formation – attackers became defenders and vice versa . Thus the Gingers managed to get behind the Maginot Line for the remainder of the game with victory sealed by Tree’s injury time winner after a dazzling dribble and cross by Pear. The Gingers had made the Semi-finals due to arguably the most significant innovation in football since the advent of the bladder in the ball. Pocket died in 1966 the day before England, using a variation on his tactics, won the World Cup. The bribery of officials at the Final would have brought a smile to his face. With the people of the Island now behind them the Gingers easily swept aside the Sudetenland Anschluss 2-0 at the Plague Pit (Tongue again among the scorers). Pasty recalls the game as a “drab, dull affair only enlightened by Square Root’s penalty save in the 75th minute from Anschluss’ star player Jiri Jawa. A miracle had occurred. The Gingers had reached the final. Indeed if we look at the Lepidan team that took the field in Paris that day we can see what Pasty means. It later transpired that Pocket also secured several tons of onions and two hundred pairs of socks to smuggle back to Jersey and needed the adulation on the pier to affect his dastardly plan. The game itself was a minor miracle. The Bulgarian referee Marko Payov, a man with pederast tendencies, had been instructed by the evil Nazi’s to make sure Lepidan won. But subtly. For the first 20 minutes he allowed a barbaric assault on the Gingers attacking players by the notorious defensive line of Arbeit, Macht and Frei. Tongue lost the use of his left leg after one particularly sickening aerial assault from Stuka and there were fears that the Gingers may not have been able to complete the game. But a strange thing happened. After twenty five minutes, a white dove appeared over the ground. The sun’s rays dappled its plumage and it fluttered over the prone Tongue as he received treatment for a head wound after an off the ball clash with Graf Spee. Was it a sign? From God? No. But it proved to be pivotal. One to nothing at half time. Howitzer levelled after 56 minutes with a speculative shot from three miles. 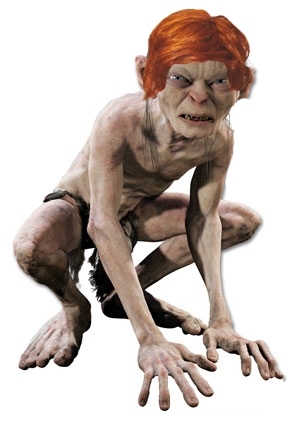 Lepidan laid siege to the Gingers goal for the next 20 minutes. Pasty continued,“Wave after wave of attack, relentless stuff. 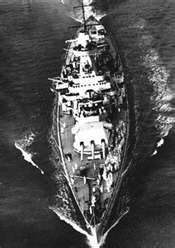 Graf Spee was controlling the centre and they pushed Panzer into attack. God knows how we hung on. And then the moment that changed our lives. Call it fate or sublime good luck, but Sheridan Square Root’s sacrifice for his team mates changed the nature of the game. As Root’s torso was carried from the pitch, an even mightier roar of “Allez Les Rouge” rolled around the ground. Pasty went in goals. The Gingers began to play like men possessed. Power, passion and no little skill filled their legs and hearts. The dove returned and played out the remaining minutes of the match as a makeshift midfield player (with minimal effect it must be said). And then that moment in the 88th minute. There was no crowd on the dock to meet them when they returned from Paris the following day. No adulation from the people of Jersey. Dumpkoff left the Island the following morning and official German war records note his death during the Battle for Berlin in 1945. Inside his tunic was found a fluffy towel. 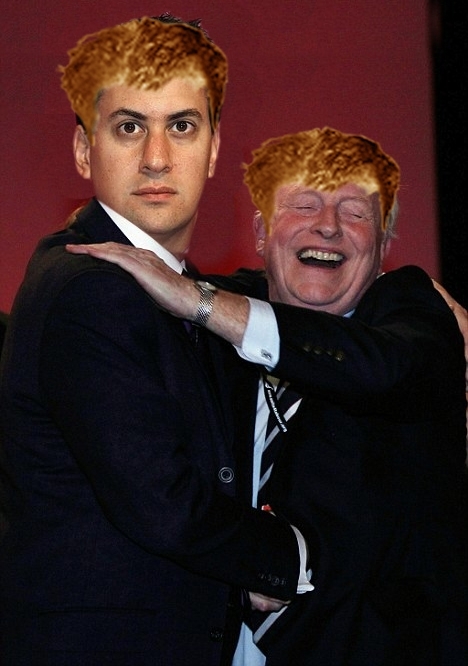 A number of the Gingers were arrested and deported to labour camps across Europe. 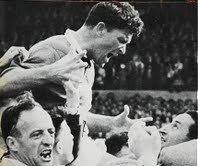 Among them the star of the team, Hughie Tongue whose goals and impish Scottish jinkery had done so much to carry his team-mates to glory. He was never heard of again. Fennel and Pear escaped to England and joined the war, both dying on the beaches of Normandy exactly a year after the final. Jeff Drain developed a successful career as a painter and decorator. And as for Pasty? He married Maude in the spring of 1946. 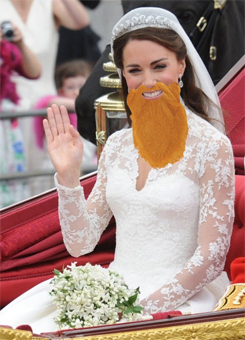 Her wedding dress was made from the original nets the Gingers had used in their goals. They remain a devoted couple. Square Root’s ear was best man. Pasty was asleep when I left his house, chomping on a bread soldier he had left. The spread was a cheap brand of margarine which I found lacked taste. I felt a pang of regret that his extraordinary story had lain hidden for so long, like sediment at the bottom of a still, dead lake. Those names Square Root, Tongue, Parsley et al all deserve to be remembered as more than Collaborators. For the Jersey Gingers pulled off one of the greatest victories in the history of football. And they dared to hope. And for that their achievements should never fade. Luis Suarez Signs Major Teeth Sponsorship Deal! 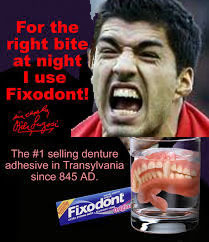 Luis Suarez has signed a major sponsorship agreement with denture fixing giant Fixodont. Man has conquered the Moon but still relies on the comb over to hide a thinning bonce. Sideburns flourish alongside clogs and bigotry. Led Zeppelin are in their caterwauling pomp, warbling nonsense about dribbling lemons and hobgoblins on chair lifts. Tooth decay is a sign of manliness. But the greatest moment of 1970? Brasil side led by the incomparable Pele, play defending champions England. Jairzinho is set free on the right. He skins Cooper and delivers the perfect cross into the penalty area. Pele, like a great big Brazilian Trout, leaps and heads the pork pie, like a great big pork pie missile. A certain goal. BUT two words these Samba Surrealists hadn’t considered. 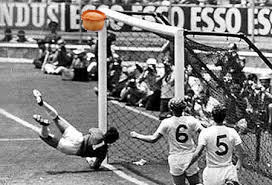 The great English ‘keeper leaps like a great big English Trout and turns the pork pie over the bar for a corner kick. The world is astonished. Pele is admonished. Banks is famished and eats the pie for his tea. 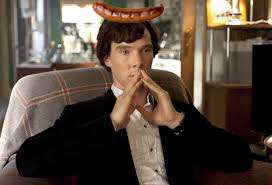 “Lovely bit o’ pie that, shame no pickle to go with it though,” were his words afterwards. To this day when I eat a pork pie, I doff a metaphorical titfer towards “Banksy” before doing so.